One would think that all the victims of the second World War did not die in vain, but the way racism is ubiquitous these days somehow undermines all their sacrifices. That’s right, racists are everywhere and their icons are even being celebrated. 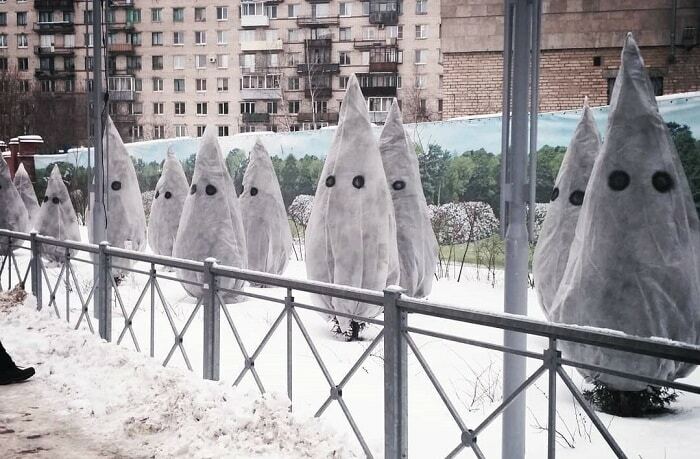 One recent example exists in Russia where a bunch of Christmas trees got vandalized to look like Ku Klux Klan (KKK) members. Well, as you can see, the whole locale is now creepy because it looks like an elaborate racist monument, all because some punks carved two circles in all of them. It also gives off the impression that there is an army of KKK members’ meeting taking place near the Primorskaya metro station on Vasilyevsky Island, which is where the trees are located. Still, it was not clear what the vandals’ intentions were. Authorities were also puzzled whether the vandals simply wanted to create an army of Christmas tree ghosts but accidentally became racist or if they deliberately made KKK members out of Christmas trees just in time for a “white” Christmas. Nevertheless, it sparked widespread condemnation online.